This Stop Hate Crime button was made to bring awareness to the ongoing struggles faced by many people. 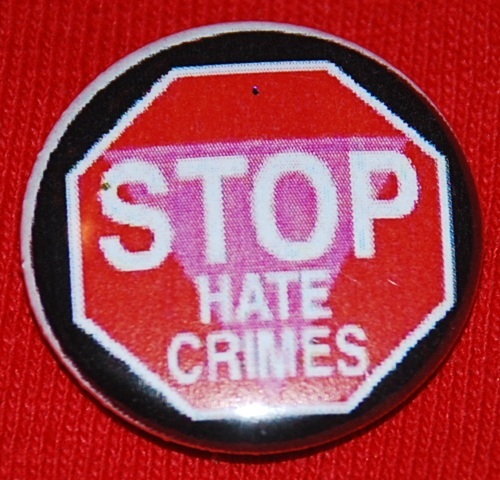 The pink triangle in the stop sign indicates this is an LGBT button. While a lot of focus about LGBT Hate Crime and discrimination is on places like Russia, it is an issue in places like Canada, even in large cities like Toronto. This LGBT pin-back button was made in Toronto. We are featuring more political buttons throughout January. Please submit political pin-back buttons you made, and we will post them! This entry was posted in Badge-A-Minit and tagged Badge-A-Minit, badge-a-minute, BadgeAminit, Badgeaminute, LGBT, political on January 2, 2014 by Barry Badge.